Riley Obenchain conjures a feeling of mischief and magic. He wears a tattered straw hat, trimmed with a red poppy, that looks like something a scarecrow might wear. His bushy black eyebrows dance when he talks, bringing to mind the woolly bear caterpillars abundant in the fall. 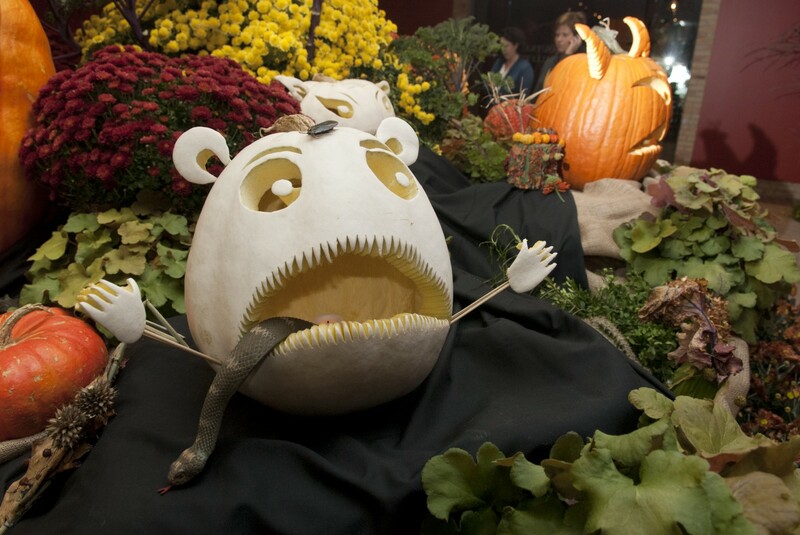 A playfulness—tinged with the macabre—also shows in the jack-o-lantern characters Obenchain creates each year for HallowFest, the Garden’s popular, family-friendly celebration of Halloween. 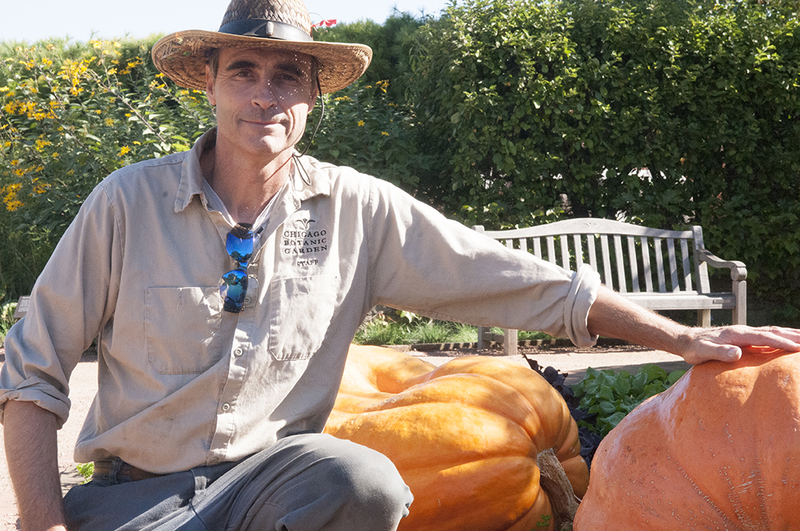 Riley Obenchain poses with some enormous jack-o-lantern fodder in the Regenstein Fruit & Vegetable Garden. Obenchain’s ghoulish, yet somehow gallant, jack-o-lanterns provide a mild dose of horror while eliciting smiles and laughs. There’s the tiny pumpkin gripped in the long, pointy teeth of a massive pumpkin. The little guy has a sort of “Oh, no, Mr. Bill” look on his face. The big, toothy smile on another jack-o-lantern gives a mixed message. Obenchain describes it as an “I’m-happy-to-see-you-because-I’m-going-to-eat you” look. “I get a lot of, ‘Wow! I could never do that!’” says Obenchain, who’s helped keep the Garden’s trams, lawnmowers, and other machinery running smoothly for 35 years, “but in actuality, anyone can do this.” Here are a few of Obenchain’s tricks and techniques, gleaned in a recent interview. The removed pieces of the eyes of this “Ernie” are recycled as ears; leftover mouth pieces are used for hands. What sorts of other materials do you use? What is the biggest pumpkin you’ve ever carved? Carving stalks instead of using toothpicks to inset eyeballs ensures they don’t rot out and stay in place while your jack-o-lantern is on display. While most of the pumpkins carved for Hallowfest are from outside growers, each year, Obenchain tries to grow a few giants of his own in friendly competition with other Garden staff members. This year, he’s growing another ‘Atlantic Giant’ with seeds saved from the thousand-plus-pound monster—if the raccoons don’t get it first! 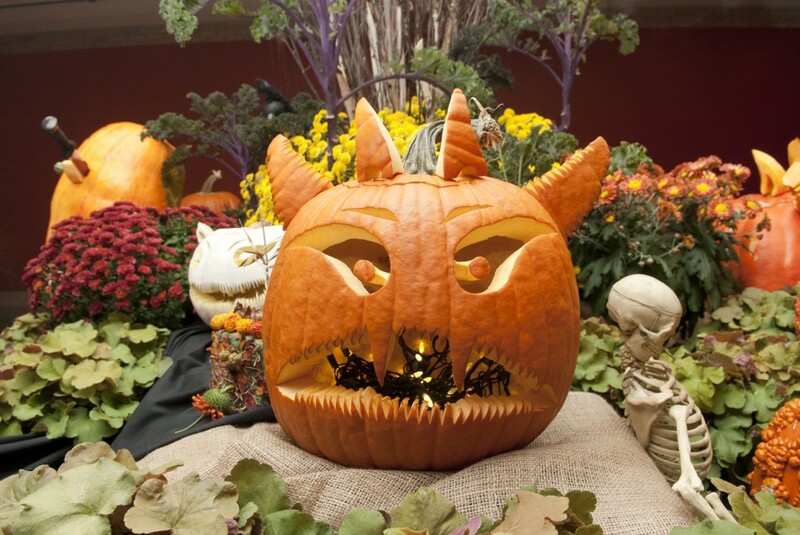 Join us for HallowFest on October 26 and 27, from 6 to 9 p.m. on Saturday and 4 to 7 p.m. on Sunday, to see Obenchain’s creations for this season.